From the left: Mr. Marwan Sakhel, Ms. Sana Al Darazi, Mr. Abdulkhaliq Khalil, Mr. Younis Al Sayed, His Excellency Mr. Abdulrahman Al Baker, Sh. Dr. Abdulaziz Al Orayer, Mr Ahmed Al Bassam. t'azur Insurance Company is pleased to announce being the largest single shareholder of 15% of Takaful Oman, the first Takaful company in the Sultanate of Oman. 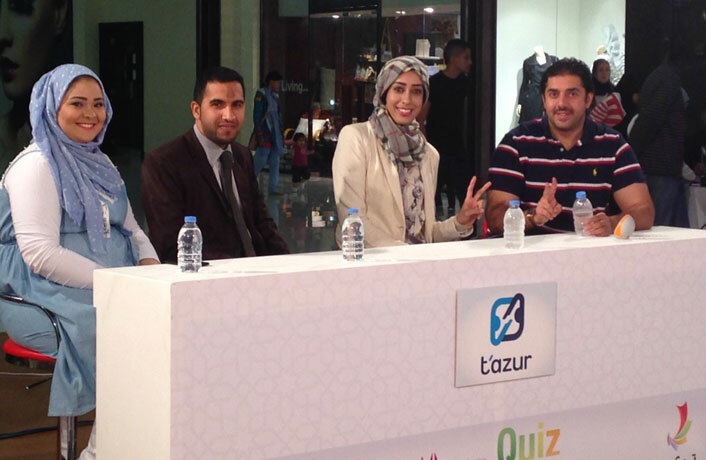 t'azur's team participates in "Tamkeen Quiz Show 2013". t'azur's team participates in "Tamkeen Quiz Show 2013" for the second year as part of the Financial Sector. The subjects were about the Kingdom of Bahrain, Tamkeen and General Knowledge. A group of Al Noor International School students visited t'azur Company recently and met with its Board Member & CEO, Mr. Yahya Nooruddin. t’azur Board Director and CEO honors female employees on the International Women’s Day as part of the company’s commitment to encourage women and emphasize on their active role in the society and continuous contribution in various fields. t'azur Insurance Company is proud to announce the promotion of Mr. Jameel Salman to Chief Accountant of t'azur Company b.s.c. (c). Mr.